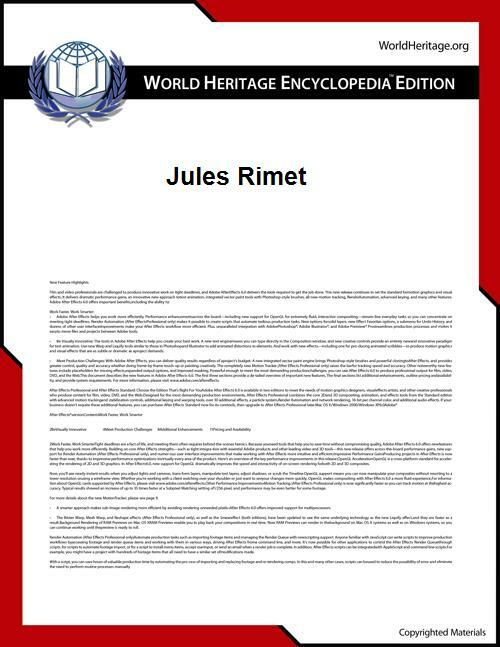 Jules Rimet (14 October 1873 – 16 October 1956) was a French football administrator who was the 3rd President of FIFA, serving from 1921 to 1954. He is FIFA's longest-serving president, in office for 33 years. He also served as the president of the French Football Federation from 1919 to 1942. On Rimet's initiative, the first FIFA World Cup was held in 1930. The Jules Rimet Trophy was named in his honour. He also founded the French football club Red Star Saint-Ouen. Jules Rimet was born in 1873 in eastern France. His father was a grocer, and the family moved to Paris in 1884 when Jules was eleven years old. He became a lawyer, and in 1897 he started a sports club called Red Star which, due to Rimet's ideals, did not discriminate against its members on the basis of class. One of the sports played at the club was football, which was becoming popular. Rimet was involved in the founding of the Fédération Internationale de Football Association (International Federation of Association Football, commonly abbreviated to FIFA) in 1904, and, while the fledgling organisation had plans for a global professional tournament, it instead was involved in running an amateur tournament as part of the 1908 Summer Olympics. The First World War put Rimet's and FIFA's plans on hold. Rimet served in the French Army as an officer and was decorated with a Croix de Guerre. Following the war in 1919, he became President of the English, Welsh and Scottish Football Associations during the early years. After taking up the post he moved once again to start a global tournament, but was opposed by the amateur football associations and Pierre de Coubertin, founder of the International Olympic Committee. In 1928 FIFA, under Rimet's leadership, went forward with plans for a "World Cup" which was held in Uruguay due to the nature of the professional game in South America, and in part because the Uruguayan Football Association offered to pay all travel costs. Rimet traveled to Uruguay for the World Cup on SS Conte Verde along with the competing European teams, all the while carrying the trophy in his bag. However Rimet's decisions on where to host the first few World Cups led to criticism: European nations complained about the 1930 World Cup because players would be out of domestic tournaments for three months, which was why only France, Belgium, Romania and Yugoslavia sent teams to compete, and those only competed because of Rimet's influence. The following World Cup was held in Italy under the Fascist rule of Benito Mussolini, which was used to promote its regime; something that Rimet was accused of ignoring. Following the Second World War, the British football associations agreed to take part from the 1950 World Cup onwards, where Rimet himself handed over the trophy to the triumphant Uruguayan team when Uruguay won the tournament for the second time. Rimet's efforts in establishing the tournament earned him a nomination for the Nobel Peace Prize in 1956. Rimet died in Suresnes, France in 1956, two days after his 83rd birthday. In 2004 he was posthumously made a member of the FIFA Order of Merit, which was collected by his grandson Yves Rimet. He is credited with being the inventor of the World Cup. 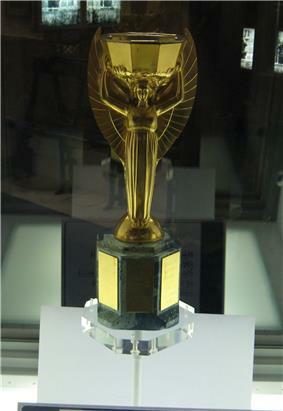 The original World Cup trophy was named the Jules Rimet Trophy in his honor. It was stolen just prior to the 1966 World Cup in England, but was found by the dog Pickles. Brazil won the tournament for the third time at the 1970 World Cup and was awarded the trophy permanently. It was stolen once more in Rio de Janeiro in 1983 and is believed to have been melted down by the thieves, although there is no conclusive proof of this. The Brazilian Football Confederation had a replica of the trophy made. Rumours of the various disappearances of the trophy and its final resting place continue to the present day. A statue of Rimet stands in Theuley in the middle of a penalty box, complete with goal. Rimet was portrayed by Academy Award nominated French actor Gerard Depardieu in the 2014 biographical drama United Passions. ^ a b c d e f g h i "Jules Rimet: The man who kicked off the World Cup". The Independent. 5 June 2006. Retrieved 10 April 2012. ^ "History of FIFA - More associations follow". FIFA. Retrieved 10 April 2012. ^ Murray, Scott (23 March 2011). "Which Fifa presidents have served longer than Sepp Blatter?". The Guardian. Retrieved 10 April 2012. ^ a b "History of FIFA - The first FIFA World Cup". FIFA. Retrieved 10 April 2012. ^ "Uruguay world's champion". The Guardian. 16 July 1950. Retrieved 10 April 2012. ^ "Sheffield FC are Real’s equals at FIFA Congress". The Star. 22 May 2004. Retrieved 10 April 2012. ^ "Jules Rimet Cup". FIFA. Retrieved 10 April 2012. ^ Kuper, Simon (3 March 2012). "My quest for football’s Holy Grail". The Financial Times. Retrieved 10 April 2012.